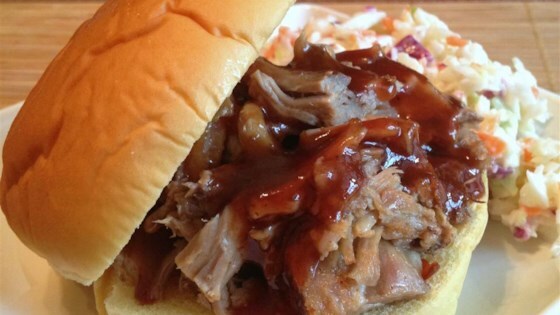 "This is one of the easiest pulled pork recipes I've made. Since my husband was from 'south of the Mason-Dixon line' and raved about pulled pork in Virginia/South Carolina, I had a tough job ahead of me, but he loved it (!) so I guess I passed the test." Arrange onion slices in the bottom of a slow cooker. Season pork with salt and pepper and place over onion. Add vinegar and water. Cook pork on Low for 8 hours. Transfer pork to a platter and shred with two forks. Remove and discard about half the pork juices from slow cooker and stir in shredded pork, barbeque sauce, and brown sugar. I always like to try different types of food and this one is good i have added some smoked paprika to enhance the flavour and that turned out very good but love the recipe. "Pulled" it after 7 hours, removed 1/2 the liquid as directed, added brown sugar and BBQ sauce, then gave it another hour. Excellent flavor for such an easy recipe. Excellent! Served it with coleslaw on Hawaiian buns. So good!